iPhone users generate 7% more traffic on the weekend than the average weekday. Saturday traffic ramps quickly from a morning low at 6:00 am to over 90% of peak usage by 11:00 am—and stays near the peak for the rest of the afternoon and evening. 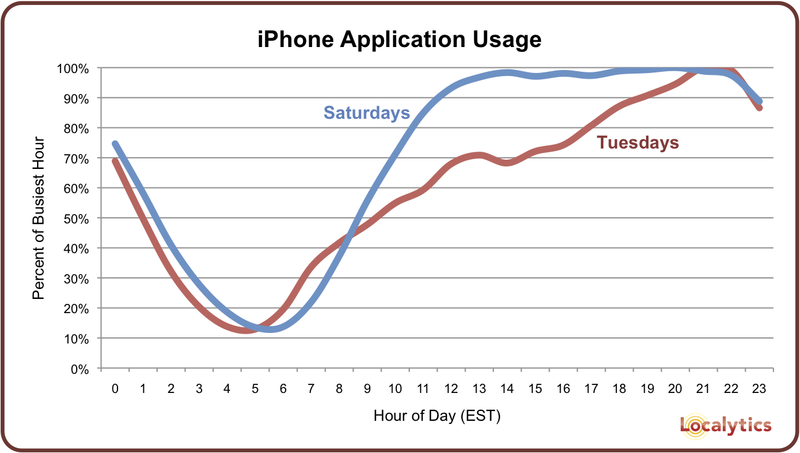 By comparison, weekday app usage is more concentrated in the evening with a slow ramp during the working day and a peak at 9:00 pm EST, when East Coast users are at home and West Coast users are commuting home. Is The Filesystem Finally Dead?